I finished building my Talos II system, and I decided to post my thoughts on it here. This is an excellent machine, the best workstation I’ve ever used. It’s very fast — it compiles Emacs and the kernel in 2 minutes, and just spins up the fans a little bit while doing so (under normal operation it’s quiet). And it’s in a completely different league in terms of openness than any other computer I’ve owned (and any other high performance computer on the market today). The system came with a nice user’s manual, and full schematics! I’ve already referred to the schematics to set up the pinmux for a rarely-used serial port so that I could use a TTL serial cable I had lying around (I submitted the device tree patch to Raptor). It has serial ports everywhere! One right into the main CPU, and two into the BMC. This is great for low level development, e.g., breaking into bootcode at an early stage. It’s so refreshing to not have to do reverse engineering and speculation on opaque things when something fails. On this machine, everything is there, you just look up the source code. Now I’m setting up my development environment and I’m learning about the PPC64 ELFv2 ABI, with a view toward figuring out how to bootstrap SBCL. I feel lucky that I got a POWER9 machine early while there are still some rough edges to figure out. The Talos II is now available for pre-order. It is the more affordable, more power-efficient successor to the Talos I machine I wrote about in a previous post. This is a very affordable machine for how powerful it will be, and there are minimal mainboard + CPU + RAM bundles (e.g., this one), around which one can build a workstation with more readily-available parts. I’ve placed an order for one of the bundles, and will buy the chassis and GPU separately (mainly to avoid high cross-border shipping fees for the full workstation). The Talos II is an important machine for Free Software, and will likely be RYF-certified by the FSF. Pre-orders end September 15th! This is a very important machine that really deserves to get built. Anyone who cares about Free Software should consider funding this project at some level, and spreading the word to their friends. If this project succeeds, it will bootstrap a market for new, owner-controlled performant desktop machines. If it fails, no such computers will exist. The project page and updates explain the current (rather depressing) state of general purpose computing better than I could, so take a look. I finished getting Excorporate and all its dependencies into GNU ELPA. 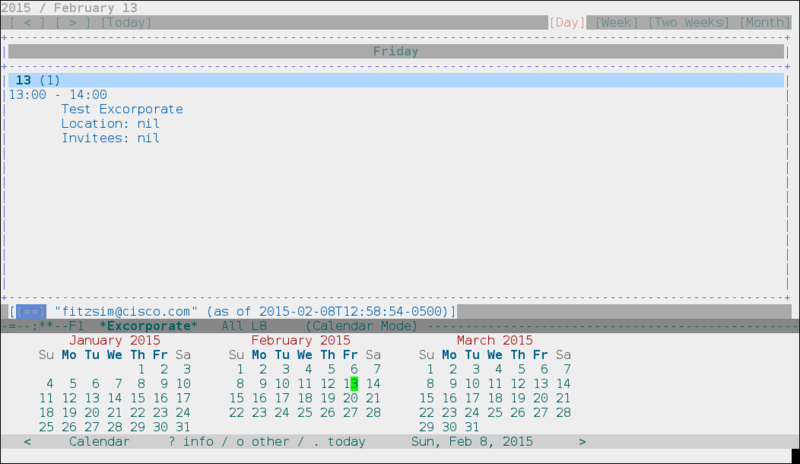 Excorporate lets Emacs retrieve calendar items from an Exchange server. I had to rewrite the default UI to use Org Mode, because Calfw isn’t entirely copyright-assigned to the FSF yet. The Calfw UI is still there for reference, but as a text file so that GNU ELPA’s build and publishing steps ignore it. Both UI handlers use the same updated APIs from the main excorporate.el library. I made sure Excorporate and all its dependencies use only features available since GNU Emacs 24.1. This is pretty good coverage; Emacs 24.1 introduced the packaging system, so if an Emacs version supports packages, it supports Excorporate. Other than DNS lookups, Excorporate is completely asynchronous, so it won’t block the Emacs main loop. And it is pure Emacs Lisp so it runs on any operating system that Emacs does. In addition to Org Mode support, release 0.7.0 collects all the suggestions users have made on this blog and adds Exchange 2007 support. I use Emacs Unified Directory Client (EUDC) for completing email addresses from LDAP and BBDB databases. It’s nice to be able to complete names from LDAP when composing emails, obviously, but it’s also nice in Org mode to M-x eudc-expand-inline someone’s name into my notes. When I first configured the EUDC LDAP backend for my environment — RHEL 6 ldapsearch, LDAP-over-SSL server — setup was very involved. There were lots of poor defaults, strange extra configuration files, function call requirements, and ldapsearch incompatibilities. EmacsWiki instructions were very long just to get sane “Givenname Surname <email@address>” completion in GNUS. I filed a bug report with configuration simplifications, bug fixes and EUDC Info manual updates, and somehow I ended up as the EUDC maintainer. I’ve committed the improvements to the Emacs master branch; they’ll be released in Emacs 25. If you’ve tried EUDC in the past and been turned off by its arcane configuration, you might want to re-read the “LDAP Configuration” section of the Info manual, and try again. If you still can’t get it working, file a bug report at bug-gnu-emacs and I’ll try to respond to it within a few days. Mention EUDC or LDAP in the subject of the report. Likewise, if you do get it working with hacks then let me know via a bug report. Here is Excorporate version 0.6.0. Thanks to everyone who tested autodiscovery on the 0.5.4 release and provided feedback. I’ve listed most of you in the Acknowledgements section. Excorporate has been accepted for inclusion in GNU ELPA but I’m still waiting on copyright assignment for one dependency before releasing it there. This release still takes the form of a tarball. First download it, then install it with M-x package-install-file. I use Exchange at work for calendaring. I also use terminal-mode emacsclient when I’m logged in from another machine. In that scenario I can’t easily open a web browser to use Outlook Web Access. 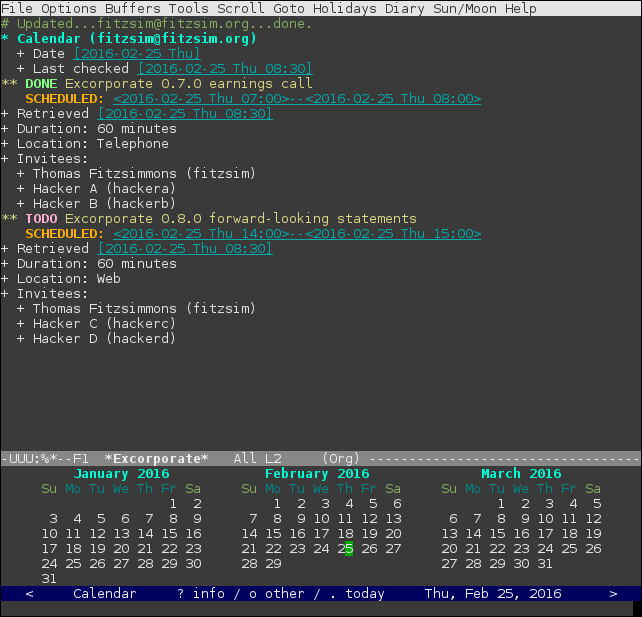 It annoyed me that I couldn’t check my schedule from within a terminal Emacs session. Thus, I did the only sensible thing and implemented full Exchange Web Services API support for Emacs. The result is a library called Excorporate that has proof-of-concept Calendar integration to show today’s meetings. It’s all written in Elisp, making it cross-platform. 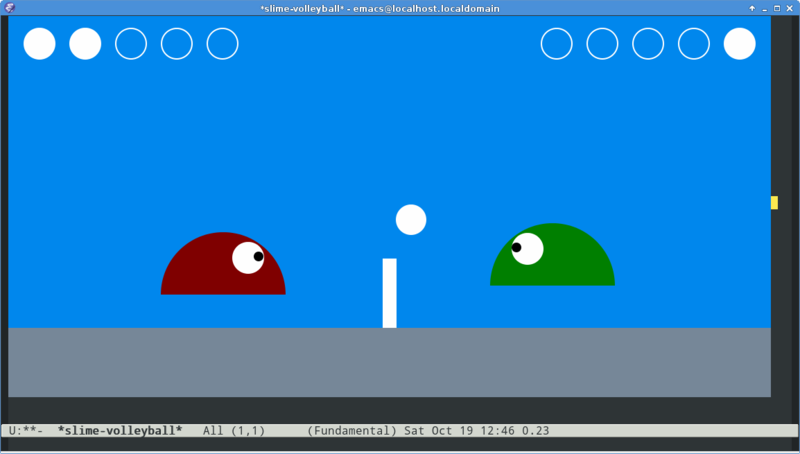 It’s also cross-Emacs; I tested it on Emacs 24.1 through Emacs 24.4, on GNU/Linux and MS-Windows. It works on all Emacs versions that support packages. implementing NTLMv2 authentication in Elisp. I’m trying to get it into GNU ELPA so that other modes can always count on its core APIs being available from a default Emacs installation. I haven’t put it on GitHub yet, to keep it hidden from the ruthless efficiency of MELPA. I was impressed and appreciative when MELPA bundled slime-volleyball shortly after I released it. But I’d prefer to keep Excorporate in GNU ELPA only for now. Anyway, I’m publishing this mode in the hope that it’s useful to other Emacs-and-Exchange users. At work I have cause to edit a TWiki that my team uses for internal documentation. I wanted to use Emacs for this task, so that I wouldn’t need to interact with a web browser text area widget. I couldn’t find anything that did that, so I took the closest thing I could find, erin.el, a TWiki markup mode, and added connectivity to it via Emacs’s url package. without ever leaving Emacs. Now with EWW to see the resulting pages, there’s no need to leave Emacs at all. This being a fork, it doesn’t qualify for MELPA, and I can’t get in touch with the original author, so it will stay in limbo as a raw repo, without ever being packaged. A while after I did this development, emacs-twiki-mode sprang up. It looks like it has some nice advantages, like orgtbl editing. If it used Emacs’s built-in URL handling instead of an external bash script I would probably switch to it. For now my erin.el fork works well enough for me. I do wish there were one monster Emacs mode that would handle all Wiki server implementations, including connectivity; a sort of Gnus for Wikis. Oh well. 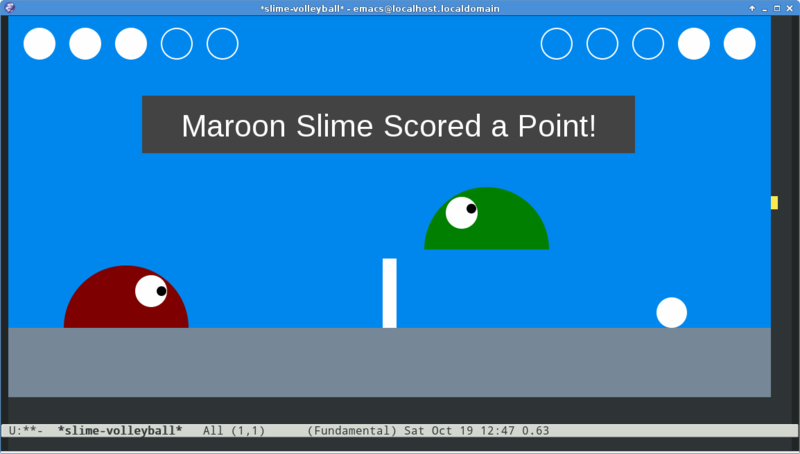 It’s a clone of the great Slime Volleyball applet I used for IcedTeaPlugin testing.